One of the iconic animals of the Okavango Delta has to the Hippo, and there are many of these ugly, rotund creatures that call the Delta home. Their deep honking noises can often be heard booming across the lagoons. A honking laugh, followed by a derisive snort announces the presence of a pod of hippopotamus in a shallow lagoon in the Delta. These large pachyderms are wide spread in the Delta. Depending on where they live in the Delta, the Hippo's habits will be differently affected by the seasonal flooding of the Okavango The annual flood increases the areas of deeper water in which they can shelter and the receding floods create the perfect conditions for fresh new grass for them to graze on. 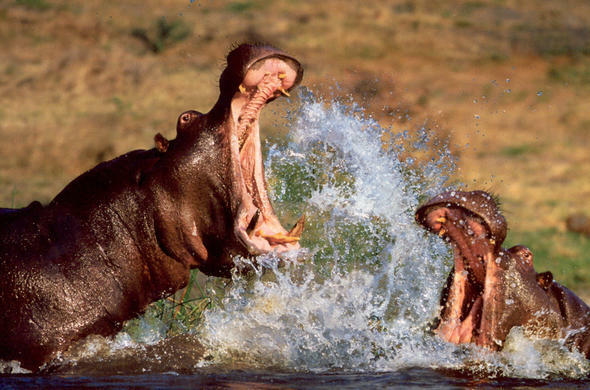 Hippos are considered to be one of the most dangerous animals in Africa due to their unpredictability. They can easily capsize a canoe or boat and caution should be taken not to approach them too closely when you are on a boating trip. 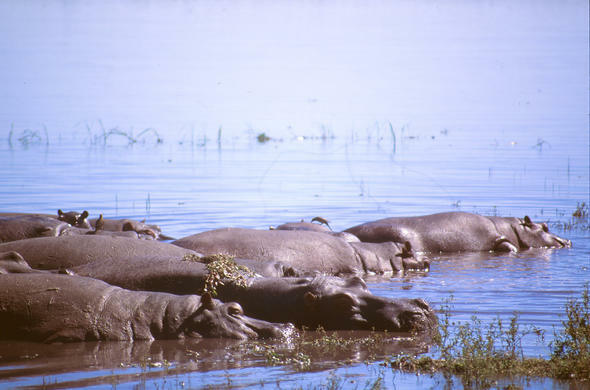 Hippos are generally found in small family groups called pods. These are presided over by a dominant male who will fight other Hippo for territory. 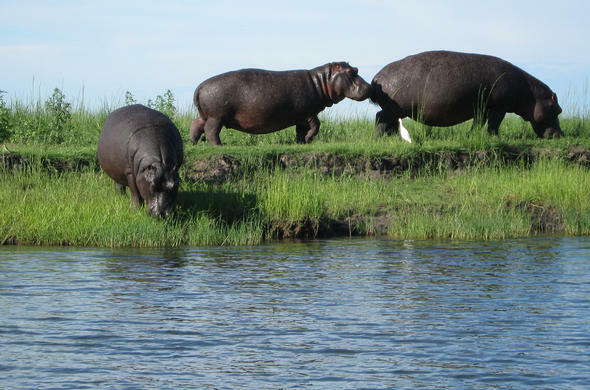 Hippos are found mostly in the areas of permanent water, Lagoons and deep channels in the Delta. The word Hippopotamus come from Greek and means "river horse," although there is nothing horse like about these huge animals. They are the third biggest land mammal, most weighing in excess of 3 tones. They have a very thick skin which can weigh up to a ton. They spend most of the day submerged in water, with just their heads sticking out. They can stay submerged for up to six minutes at a time. In areas where they are undisturbed by human activity, they often will lie out in the morning sunshine. They emerge at night to graze on the flood plains and islands in the Delta. They usually spend between 4 and six hours eating and can wander up to 4km on their nightly round. Hippos usually enter and leave the water in the same place, creating well worn Hippo paths in the dense reeds through the Delta. Hippos are social animals and have a complex social hierarchy. 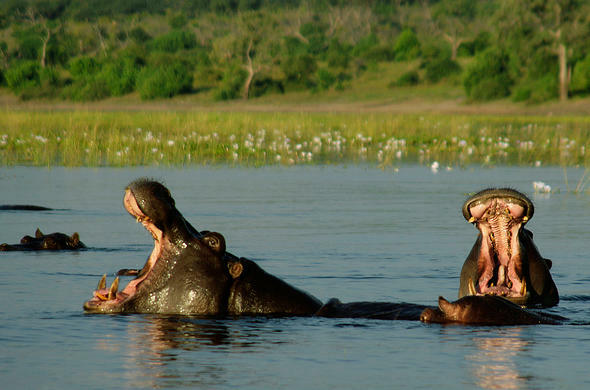 When the flood waters recede different pods of hippo are often forced to share territory which results in an uneasy alliance, with males constantly fighting over territory. 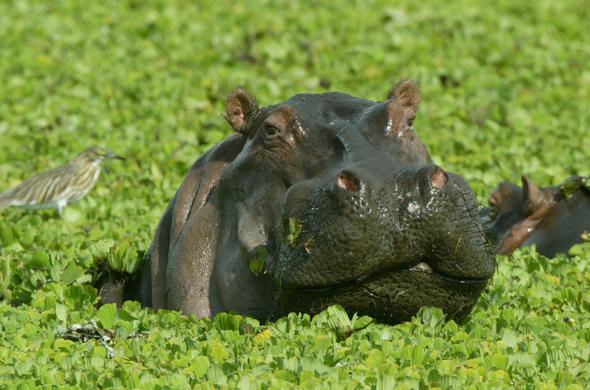 Hippos are hunted by Lion when they are on land, and Crocodiles may occasionally take small ones, though this is rare. Their main threat is from humans, who hunt them for their meat and to protect their crops. Luckily the Hippo population of the Okavango Delta is thriving.